How Do I Get My Cat To Use The Litter-Robot Open Air? – Ginger Kitties Four – Celebrating the Kitties We Love! Cats are rather intelligent and sensitive. In most cases, your cat will not have an issue acclimatizing to a new litter box. Of course, in many of those cases you will see a bit of resistance at first, but that’s just your cat trying to decide whether or not they need that kind of change in their lives at the moment. Sooner rather than later, they take to the new litter box with minimal fuss. However, when it comes to a technologically advanced litter box like the Litter Robot Open Air, there may be more than just a little resistance involved. You might have to employ different strategies to get them used to the sound as well as the environment that comes with this new device. Many people will tell you that you need to get this new, automatic self-cleaning litter box because it’s where technology is headed. We all want to own state-of-the-art devices that make our lives easier (and in some cases, because the guy down the street has one and he won’t stop rubbing it in your face). But the truth of the matter is that, you should get the new Litter Robot because it involves no more scooping. Yes you read that right. You no longer have to scoop out your cats litter box in order to clean it. The Litter Robot is self-cleaning and makes a lot more sense for those of us who are way too busy or squeamish about scooping cat poop from the litter boxes. No more scooping – that is a benefit that cannot be beat. How do I get my cat to use the Litter-Robot? Of course, what is convenient for you won’t necessarily be convenient for your kitty. She might have her own idea of what she thinks is convenient. What you need to do is give her time to see that the new litter box is hers and that she will be more comfortable using it. Like all children, they never really know that what we do is for their own good in the end. This is a trick that works well every time. The one thing you do not want to do is to completely switch out the old litter box for the new one without warning or gradual progress. The best approach would be to introduce the new litter robot slowly into your cat’s life. Place it next to his/her old litter box and let them get acquainted. 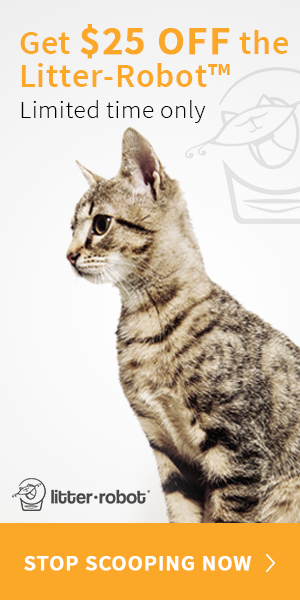 Rig the odds in favor of the new litter robot by luring your cat with treats and such. Also, gradually make the old litter box less attractive by letting it get full and not cleaned. Soon your cat, since they are choosy creatures, will begin to sort out the new, cleaner litter box. The folly of switching out the litter boxes abruptly is that it may cause your cat to stage a boycott of the entire process. In the absence of their old litter box, they might choose to relieve themselves on your furniture or carpet as opposed to this new, imposing device that is the Litter Robot. Before you know it, they will be more scooping in your life as opposed to ‘no more scooping’. Because the litter-robot features a gentle rotation when it is sifting and self-cleaning, your cat might not be exactly too eager to jump into it while it is still spinning. In fact, almost no cat will be quick to enter a newly introduced device that has electrical movements they cannot control (self-preservation and what not). So the idea here is to introduce your cat to the device WITHOUT the spinning at first. Make sure your kitty knows that this is their new litter box and let them approach it as they would any other litter box. The only difference would be that this one is slightly taller and a little sleeker than their average litter box. Throughout this time, turn on the litter-robot once the cat is done using it. Let them see that process in play, they will become accustomed to the movement and the sound. They will also get to see that it is not a dangerous device. After he/she gets used to going to the new litter box, you can slowly introduce the auto-clean feature. Even though there will be a little apprehension at first, soon enough, he/she will become intrigued by the movement. Apart from luring them in with treats and promises of a clean litter box, you can simply cover the new litter robot in something that cats seem to love for reasons we may never understand – cardboard boxes. The Litter Robot comes with a cardboard box that fits it perfectly. All you have to do now is cut out holes for the entry and the waste tray. Instead of looking at the new device as imposing and weird, your cat might just see it as another play thing made out of a cardboard box. Can large/small/old cats use the Litter-Robot? This is the best part of this new technology; the Litter-Robot is built to accommodate cats of all sizes. So, if you have a fussy cat that doesn’t like to change its posture or squeeze into unnecessarily smaller spaces, you will not have any issue with this automated litter box in that regards. Cats of all ages prefer a clean litter box, no matter the shape, over one that is smelly and dirty. Even kittens under five pounds can use it, but you will have to manually activate the cleaning cycle since cats must weigh at least five pounds for the cat sensor to activate once a cat has completed doing his/her business and exited the Litter Robot. Will my cat use the Litter Robot? Yes, your cat will use the Litter Robot. Of course, it might take a few tries and a bit of time depending on how you approach the whole concept and how fussy your cat can be. A little persistence and a great deal of bribing as well as a few underhanded tactics like letting the old litter box get full without cleaning it will get your cat to use the new Litter Robot. The best part of it all is that once you have the Litter Robot, you shall have been set free. There will be no more scooping. Now you can have as much fun with your kitty as you desire without worrying about all that scooping when the inevitable time comes.